Jackie, 20, from Houston, born in Mexico. healthy for years to come. I know there is no way to repay the sacrifices they have made for me, but I hope a college diploma and a successful career assures them their sacrifices were not in vain. That’s my advice for others: whenever you feel discouraged, simply think of your parents or family’s sacrifices, your own sacrifices, and the satisfaction you will feel when you finally wear your cap and gown and walk down that stage. Imagine the future you will forge with the sacrifices you make today. America has opened so many doors for me, and I feel I became part of the country the moment I set foot in it. 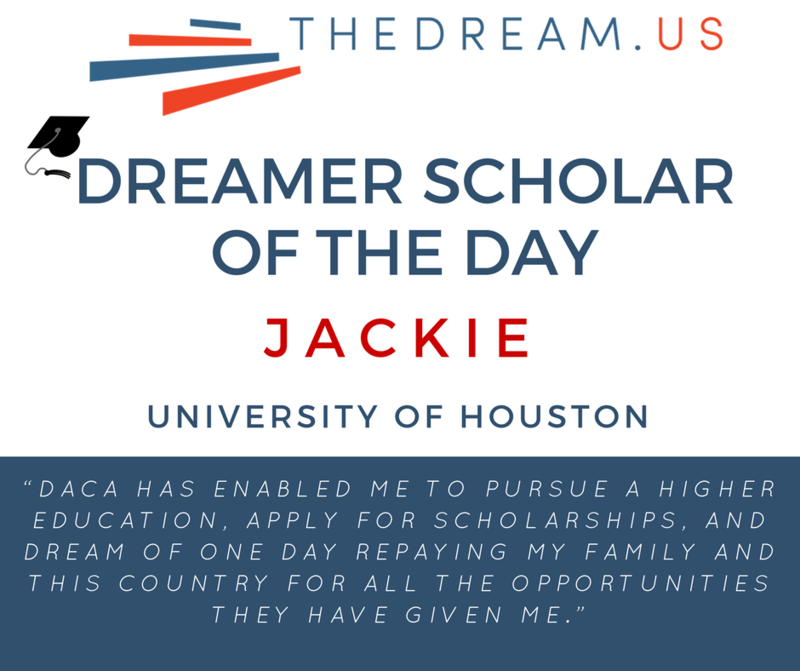 DACA has enabled me to pursue a higher education, apply for scholarships, and dream of one day repaying my family and this country for all the opportunities they have given me.